This is a USED Clean Pull (pulled from a working system) 2.5" Hard Drive. Tested and then securely wiped of all data. Refurbished Laptop Thin Hybrid SSHD 500GB HDD. Installs and works just like a traditional hard drive in any laptop or PC, and with any OS and application. Serial numbers have been taken from these hard drives. 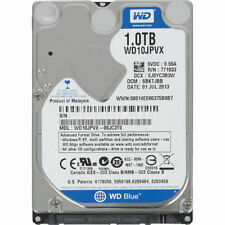 Western Digital WD10JPCX 1TB 5400RPM 8MB Cache SATA 6.0Gb/s 2.5" Internal Notebook Hard Drive - OEM. Capacity 1TB. Type: HDD (Hard Disk Drive). Interface: SATA III. Rotation Speed: 5400 RPM. SATA interface. •Capacity: 2TB. 1 x Seagate 2TB 2.5" Hard drive. Seagate SATA 2.5" Internal LAPTOP Hard Drive Disk HDD. • Interface: SATA 6Gb/s. • SATA Native Command Queuing feature. • SATA 6Gb/s interface support. All serial numbers Recorded with security seal attached. All backed by a 2-year limited warranty. A slim, high-performance HDD which integrates easily. • Standard SATA drive mounting. • Easy upgrade for most 7mm laptop designs. Looking for dependable and secure data encryption?. This is a used HP 300GB 10K SFF DP 6G SAS HDD. The drive is housed in an official HP caddy supported in G5/G6/G7 servers. The drive has been recently removed from a production server and is in fully working order. 100% Health and Performance status! 2TB Seagate ST2000LX001 2.5" FireCuda, SSHD, 8GB MLC NAND, SATA III - 6Gb/s, 5400rpm, 128MB Cache, 7 mm Height, OEM. Seagate 2TB FireCuda 2.5" SATA Laptop Hybrid SSHD/Solid State Hybrid Drive. MPN ST2000LX001. Seagate /ST2000LM007. Seagate 2TB 2.5" Slim Sata Hard drive. 2TB 2.5" Seagate Slim Hard Drive. Buffer Size: 128 MB. Interface: SATA (Serial ATA) III. Spindle Speed: 5400 RPM. Dell's INTERNATIONAL Warranty Dell's Worldwide Service ensures the, repair of your system, following phone-based troubleshooting. Due to its unique spring design, this docking station holds both your 2.5" and 3.5" HDD or SSD firmly in place. Moreover, the e-SATA interface accommodates all SATA standards (SATA, SATA II, SATA III). Model Number - ST300MP0005. Hard drive is supplied installed into Dell Compellent caddy. What is pictured is generally what you will receive. While we endeavour to use pictures of the actual item, this is not always possible when we have more than one for sale. Model: WD10JPVX. Capacity: 1TB. 1 x Western Digital 1TB 2.5" Hard drive. WD products go through extensive Functional Integrity Testing (F.I.T) prior to any product launch. SATA interface. Interface: SATA 6.0Gb/s. 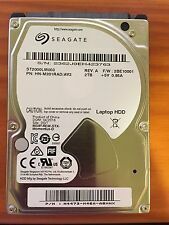 Seagate Laptop Thin SSHD 500GB, Internal, 5400RPM, 2.5 inch (ST500LM000) Hard D…. Condition is Seller refurbished. Dispatched with Royal Mail 1st Class. Perfect upgrade for your HP G5 G6 or G7 Server. They have all passed thorough testing including HP Smart Tests. We Also Record Serial Numbers. made with love by. Perpendicular Magnetic Recording and Tunnel Magneto-Resistive technologies also ensure fast, stable recording that makes the most of your hard drive space. Cache: 128 MB. Toshiba Dynamic Cache Technology. LAPTOP HDD SATA 60GB 80GB 120GB 160GB 250GB 320GB 500GB 750GB HARD DISK 2.5"
Dell Part No. 0PCXYC. WD 1TB 2.5" Slim Sata Hard drive 7mm. 1TB 2.5" WD Slim Hard Drive 7mm. Buffer Size 128 MB. Interface SATA 6Gb/s. Device Type Hard drive - internal. Dell's INTERNATIONAL Warranty Dell's Worldwide Service ensures the, repair of your system, following phone-based troubleshooting. 600GB HGST 0B26013 Ultrastar C10K900 2.5" SAS-2 6Gb/s 10000rpm 64MB Cache 3.8ms. BUY IT NOW 1 UNIT IN 2.5" SFF CADDY t610 t710 R610 R710 R810 R820 R720 R720XD M610 M710HD COMPATIBLE. COMPATIBLE WITH DELL R-SERIES GEN 11 GEN12 ALL GENERATION. Western Digital Scorpio Blue - 500GB 7mm (WD5000LPCX). WD has added new energy efficiency and shock tolerance features to Scorpio Blue in hopes of leveling the playing field for two areas where hard drives usually have trouble keeping up. 500Gb SATA 2 3.0Gb/s 5400/7200 RPM 3.5" Internal HDD. 500GB HDD Pre Loaded with Fresh Installation of Genuine Windows 10 Professional. Insert the HDD and let it run, Windows will install all the necessary drivers. 2.5" 1TB / 1000GB SATA Laptop Hard Disk Drive. Laptop 5,400RPM 4,200RPM. All drives are standard speed for that size - usually 5,400RPM. All drives are standard speed for that size Typical Speeds. TOSHIBA MK5075GSX. Buffer Size. Hard Disk Drive Technical Details. Power Required (Seek). Toshiba Corp., Storage Device Division. Rotational Speed. Hard Disk Model. Disk Interface. Video surveillance (EA). First 7200 RPM, 500GB1 in a 7mm, single-disk design. HGST provides enhanced availability models of the Travelstar Z7K500 that allow 24x7 access to data to support applications that require round-the-clock operation. These drives will work in all HP G5, G6 and G7 Servers DL360 DL380 etc. Fully tested and passed all HP Smart Diagnostics. HITACHI HUC106060CSS600, 600GB 10K SAS 2.5" HDD. Securely data wiped and tested. We are able to source hard to find parts for Legacy systems through to the latest new in box parts for the latest generations of servers & storage systems. 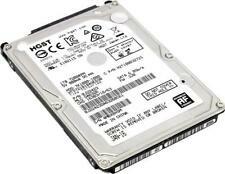 HGST 500GB 2.5" SATA HDD 7200 rpm – laptop hard drive – fully working - TESTED. Condition is Used. Dispatched with Royal Mail 2nd Class. Capacity: 1000GB / 1TB. The hard drive is in full working order and good condition as has not been used much. Capacity: 500GB. Interface: SATA. Item has been pulled from salvage machine so expect the item to be in a used condition with minor scuffs etc. There are only 4 MARs in the United Kingdom. 2.5" 750GB SATA Laptop Hard Disk Drive. Laptop 5,400RPM 4,200RPM. All drives are standard speed for that size - usually 5,400RPM. All drives are standard speed for that size Typical Speeds. Capacity - 300GB. Spindle Speed - 10000RPM. Assembly Part# 693569-001. Assembly Part# 666355-001. Data Transfer Rate - 6G = 6Gb/sec (750 MB/s). Assembly Part# 597609-001. Interface Type - Serial Attached SCSI. Seagate 4TB ST4000DM000 F/W:CC54 P/N:1F2168 Desktop- 12 M Warranty. Interface: SATA. Max Allerton 8 Clybouw Avenue Horsham West Sussex RH123UN United Kingdom. Pick up services are also available at our warehouse.